Ancient Egypt, presented by the British Museum, uses objects from the museum's collection to give users an interactive overview of Egyptian life. This site has an elegant interface with photographs of artifacts from the British Museum. Users need Shockwave to play the challenges. Visitors will find it easy to enter each of the ten chapters from the menu page by clicking on the word or the graphic associated with that chapter. An on-site glossary provides definitions of linked difficult words. This interactive exhibit from the British Museum presents ten themes related to ancient Egypt. Each of the themes is presented in three different formats: Story, Explore, and Challenge. 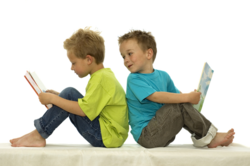 Students will enjoy reading the Story section about each theme in language they can understand. The Explore section allows users to browse according to their personal interests. And the Challenge is an activity for practicing skills. The Staff Room is for teachers and includes summaries of each chapter, ideas for classroom setup, and a well-stocked resource section that educators can search by chapter, topic, or key element. The resources are designed to tie online activities to classroom instruction and include background information, discussions, work sheets, object study, a site trail, an inquiry grid, and follow-ups.